Anyone with a casual interest in rugby union hoping to see Wales' Six Nations Grand Slam winners in action this weekend is going to be disappointed. 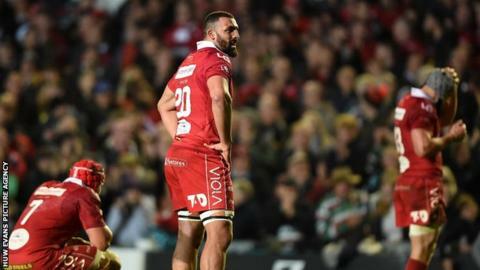 It's European quarter-finals time and none of Wales' four regions is involved in the knockout stages of the Champions Cup or the second-tier Challenge Cup. Only three of the 23 players who faced down Ireland in front of a delirious crowd in the Cardiff rain are likely to be involved. Liam Williams plays for Saracens who face Glasgow in the Champions Cup; Dan Biggar will face Clermont Auvergne with Northampton in the Challenge Cup where Josh Adams' Worcester tackle Harlequins. Prop Tomas Francis' Exeter team haven't made it. The other 19 players all play in Wales and have the weekend off. Feast to famine in a matter of two weeks; main attraction to also-ran onlookers in less than the time it took them to prepare to beat England after their win in Italy. The contrast between Wales' international success in Europe compared with the regions could not be more stark. Since 2005 Wales have won the Six Nations title five times, four of those Grand Slams. Over the same period no Welsh region has reached the final of the Champions' Cup. Cardiff Blues and Scarlets have all reached semi-finals - Blues missing out on a place in the 2009 final when they lost to Leicester Tigers in a place-kicking shootout after a 29-29 draw. The Blues have also twice won the Challenge Cup - but that's like comparing Georgia winning the European Rugby Championship with Wales' Six Nation Grand Slam triumph. Impressive... but not really the same thing. Take a look at this weekend's fixtures and you'll see two Scottish teams, an impressive achievement by Edinburgh and Glasgow, and three Irish provinces. It is worth remembering that while Scotland played some of the most entertaining and attractive rugby of the Six Nations, their only win was against Italy who haven't won a match in the tournament since 2015 - when they beat Scotland. If the two Scottish teams can do it in Europe, why can't Ospreys, Scarlets, Cardiff Blues or Dragons? Former Wales and British & Irish Lions flanker Martyn Williams believes the Scottish example holds a clue. "That's Welsh rugby for you. I genuinely think Brexit is easier to understand than the ins and outs of Welsh rugby," Williams told the Scrum V Rugby podcast. "It doesn't make sense, does it? "It is a real shame because it's the showpiece of European club rugby - especially when you see the Grand Slam and what Wales have just done in the Six Nations. "You look at Edinburgh and Glasgow, they have only got two teams in Scotland. "God forbid - and I'm not suggesting this - but you imagine we did only have two teams in Wales. "I'm pretty sure if you merged Ospreys/Scarlets Dragons/Blues there's a good chance you'd have at least one quarter-final team out of them and that's what Scotland have done." A potential merger of Scarlets and Ospreys punctured Wales' preparations for the match against Scotland in the Six Nations, with coach Warren Gatland claiming it affected the players. It was quickly ditched amid rancour, claim and counter-claim with Ospreys chairman Mike James stepping down from his role. But the question of funding the Welsh domestic game - often blamed as a reason for Welsh under-achievement in European competition - has been partly addressed by the deal which arose out of the domestic strife. The Professional Rugby Agreement has raised overall funding for the four regions from £10m to £20m a year, though the money will not be distributed evenly between the four regions. It brings funding roughly in line with Scotland, but less than Ireland (reported to be 7m Euro) and England (£7m plus two marquee players). All of which pales by comparison with France, where player budgets are claimed to be as high as 30m Euro. "I think in fairness to Scarlets they over-achieved last year. When you look at the budgets of all the regions compared to the Irish, English and the French, we shouldn't really be getting out of the pools this year," added Williams. Though there remains the conundrum of how the same players - albeit together in one squad - can beat the best of Europe when they play for Wales. "You look at all those players and how they played and then regionally I suppose you could point to the fact that squad depth isn't as strong in Wales' regional teams as those others," argues Williams. "The English and French have got so much money that in their squads they've got so many southern hemisphere players." The new funding will have filtered through by the next European campaign and the Welsh regions have already started consolidating their squads. The real concern for Welsh fans now is teams qualifying for the 2019-20 Champions' Cup. With guaranteed places a thing of the past, none of the Welsh regions is currently occupying a qualifying spot in the Pro14 with three rounds of matches remaining. Blues, Scarlets and Ospreys could still make it - but they have to deliver wins in the next month and could end up knocking each other out of contention in the final round on April 27. Judgement Day, when Dragons play Scarlets and Blues face Ospreys at the Principality Stadium, might just live up to its name. Williams knows the excitement and agony of European rugby's knockout stages first hand. He missed a place kick in the sudden-death shoot out with Leicester, but does not let that bad experience colour his view of the event. "It's the best quarter-finals of any sport I think, the best weekend to watch it. European quarter-finals are brilliant, I've always loved them and I've been lucky to play in a few as well," he says. "It's such a shame that there's no Welsh team in there."